I've blogged before about the recent slough of record attempting voyages aboard sailboats. While I applaud the courage, endurance, and state of mind required to make some of these attempts, I'm not personally inspired to break any records or create a media splash. I quite simply hope to Sail Far and Live Free. I do, however, find some of the current record voyages and hype worth mentioning. One such voyage I did find interesting and worthwhile was that of the Around the Americas (ATA) expedition. 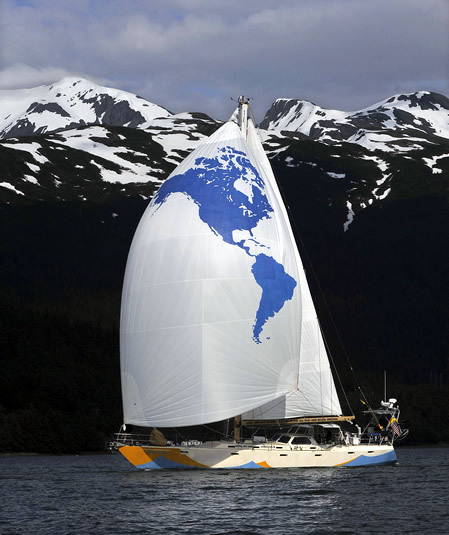 During 2009/2010, the crew of s/v Ocean Watch sailed her 25,000 miles literally all the way around both North and South America with the mission of inspiring, educating, and engaging citizens of the Americas to protect our fragile oceans. A worthy cause, right? My former life as a marine biologist has me believing so. The Around the Americas expedition raised awareness for an important issue with an engaging website, excellent crew logs, fabulous pictures, educational shoreside seminars, and a hoard media coverage. A crew of four sailing a steel-hulled 64' vessel all the way around two continents, including a passage of Cape Horn and a challenging route through polar ice north of Canada, for a worthy cause is notable. But this blog post isn't about the ATA expedition. This post is about another expedition around the Americas. An important difference: This time the crew consists of a solo sailor, a VERY modest 27' fiberglass sailboat, and another very worthy cause. Meet Matt Rutherford, a sailor taking his 1970's era Albin Vega non-stop (yes, non-stop!) around the Americas, including an east-to-west transit of the icy Northwest Passage. Matt is using his remarkable voyage to raise money for Chesapeake Regional Accessible Boating (CRAB), a non-profit organization dedicated to making the thrill of sailing a reality for those with physical and mental disabilities. So can he make it all the way around both continents solo in such a small boat? If you've been following this story, you know that Matt is very near the end of his journey and is about to cross over his outbound track anytime between now and Saturday. Yes, he will indeed be the first to circumnavigate the Americas single-handed. You can see Matt's progress and watch him finish his expedition here on his website. My Mt. Gay Rum Regatta hat goes off to these two sailing expeditions that have shown us a lot about what it means to Sail Far and Live Free. I hope you might entertain these suggestions for your site.